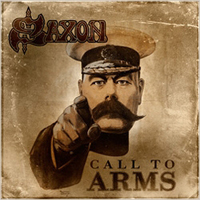 “Call to Arms” starts with a song coming as if from the first albums of SAXON: middle tempo, this Southern taste for blues which distinguished the band from the other representatives of the NWOBHM. Even the sound is not modern and “pumped up”. Behind the sincere title of the next track “Back In ‘79” is hidden a bow to BLACK SABBATH which sends the perception even further back in time. A cheerful song peculiar to Buff & company follows. The longest and the most “British” as lyrics composition sounds as classic hard rock without any surprises. The eponymous of the album song has so deep feelings in the vocals and at the same time emphasized rhythm that sounds like a powerful URIAH HEEP. You can find more rock ‘n’ roll and early speed SAXON. “When Doomsday comes…” (8th track) starts with a quote from DEEP PURPLE and obviously is influenced from them – the solos, the keyboards, and the singing carry the sign of the inheritance of the classicists. The next title (besides its coincidence with an album of OZZY) sounds as the early BLACK SABBATH but a little bit more optimistic. In the workers’ hymn “Ballad of the Working Man” (10th track) SAXON again found themselves. The orchestrate version of “Call to Arms” sets the end of the album and does not sound so different from the original.